At least 221 people have died and more than 1.5m been displaced by monsoon flooding across India, Nepal and Bangladesh, as rescuers scoured submerged villages for the missing. Bangladeshis sail on a raft made of banana tree trunks in an area submerged by floods in Kurigram, northern Bangladesh. 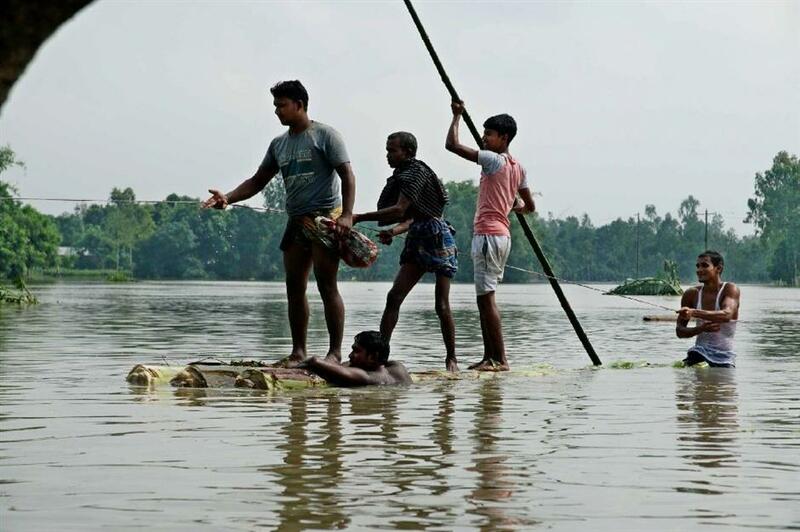 At least 221 people have died and more than 1.5 million been displaced by monsoon flooding across India, Nepal and Bangladesh, officials said Tuesday, as rescuers scoured submerged villages for the missing. In Nepal, severe flooding has left tens of thousands of homes totally underwater in the populous southern lowlands, with nearly 20 percent of the population affected. "As per the data we have received so far, 111 have been killed, 35 are still missing and a search operation is underway," Home Minister Janardan Sharma told parliament Tuesday. A third of neighbouring Bangladesh is flooded, with at least 29 dead as relentless monsoon rains pound the densely-populated riverine country. "Another 1.5 million people have been marooned," Reaz Ahmed, head of Bangladesh's disaster management department told AFP. Almost 1,200 shelters have been erected across Bangladesh, while the army has been deployed to reinforce weakened river embankments and to assist with search and rescue operations. In the border district of Lalmonirhat, roughly 600 Indian nationals took shelter in Bangladeshi villages along with their stricken livestock, the district's government administrator Shafiul Atif told AFP. India has also suffered from torrential downpours and flash flooding, worsening a monsoon that has already claimed lives. At least 81 people have died in the eastern states of Bihar and West Bengal, and northeastern Assam state, over the last few days, a government official told AFP on Tuesday. Train services have been cut entirely to the northeast, and at least 200,000 people are living in emergency camps in Assam, a remote state that suffers frequent flooding during the annual rains. In Nepal, residents in hard-hit Saptari district blamed the government for failing to solve the seasonal floods and quickly send aid to those in need. "Many have lost their homes. Families don't have food or shelter. We are just helping each other," said local resident Pankaj Mishra. "What we need is for the government to solve this problem. We have been suffering for decades every year. The river troubles us every year." Kathmandu has been criticised for enacting a "one-door" policy requiring all aid for flood victims to flow through a government-run central disaster agency. The diktat threatens to delay the delivery of relief supplies say volunteers and aid agencies, which have warned Nepal faces a humanitarian crisis if food and water does not reach the worst-affected areas. "Unless there is an effective model of rescue and relief operation, one-door policy will only kill or aggravate the situation," said local volunteer Arpan Shrestha.